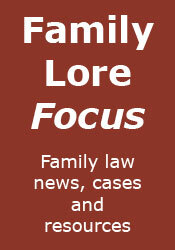 Family Lore: Families and Relationships Green Paper: Improving the family justice system? I'm sure compulsory mediation is no panacea, but it is interesting how many people are now aguing for it. In his book Taken Into Custody Stephen Baskerville points out that no one agrees to anything in mediation if they think they can get a better deal in court; someone else (I forget who) said that all mediation takes place 'in the shadow of the law'. In other words, mediation is only as good as the law is. Perhaps the proposal made by Sandra Davies of Mishcon de Reya that litigation be made almost prohibitively expensive has some merit. That's easy for her to say - her clients could still afford it! I agree that no-one would go for mediation if they thought they would get a better deal in court. It is also quite harmful to anyone who has suffered any kind of abuse, including emotional abuse from a partner. It is perfectly possible for an accomplished abuser to continue abusing during mediation. Lying with impunity in a calm fashion which gets the other party all riled up thus making them appear uncooperative. My alcoholic partner sat and calmly lied about the amount of time he normally spent in his children's company, he lied about my behaviour, he lied about how well his business was doing. All this is dealt with much better in court.